Dressing with an accent color as the third piece can really make your wardrobe more versatile and interesting with so many possible combinations. 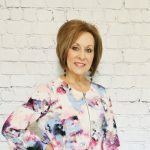 This post shows how to build different looks from two different types of jeans with the same top, and then layering on a lightweight cardigan in the accent color. I have minimized the jewelry to show more of the two base pieces that build up to the third piece that completes the outfits. The choice of colors in this Taylor and Sage Tank can lead to several different accent choices. For the main accent color, I chose the peachy-coral since that is a color that is flattering to most skin tones. I found a similar top in this brand on Amazon. 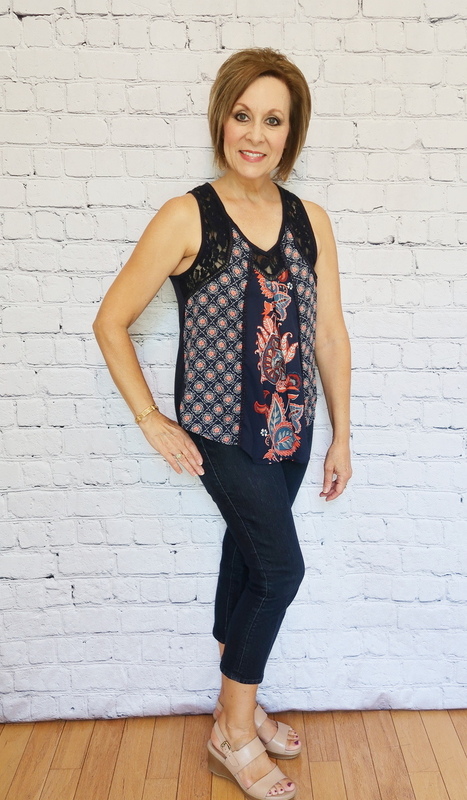 The tank has a soft pleat in the front that adds a nice flow to the style. White jeans are a clean fresh base with the colorful navy top. My favorite white jeans are the Mid-Rise Super Skinny style from Old Navy. These jeans have plenty of stretch and are comfortable. I did go up one size to have a smooth look, but probably could have stayed with my actual size. These jeans do relax after wearing them for a few hours. I rolled up the cuffs one roll for a dressier look with sandals. More skin showing above the ankle makes your legs look longer and leaner for a nicely balanced appearance. Adding on the accent color third piece brings the whole outfit together. The lightweight cardigan is Kim Rogers brand. I found two similar options for you on Amazon. Both the tank and cardigan have a nice soft flow from the body that would be flattering to most body types. Changing the shoe to gold wedge sandals gives a more neutral balance bringing the eye up toward the main focal colors. My wedges are a few years old and are by Naturalizer. I found a similar option here on Amazon. This second look is a dark bold bottom with the bold tank top, giving it more depth and color. My dark wash jeans are from Ann Taylor Loft, they are the Curvy Kick Crop style. I bought these a couple of years ago, so the styles and names have changed. Their site shows crop or skinny crop, hard to tell much difference. A lighter tone shoe option gives it a more neutral, casual look. These tan wedge platform sandals are called “Vibrant” and are by Naturalizer (2-1/4″ heel, 1″ platform front, cushioned insole), you can shop a similar style here at Amazon. And again, adding on the peachy-coral cardigan to complete the third piece finished look. 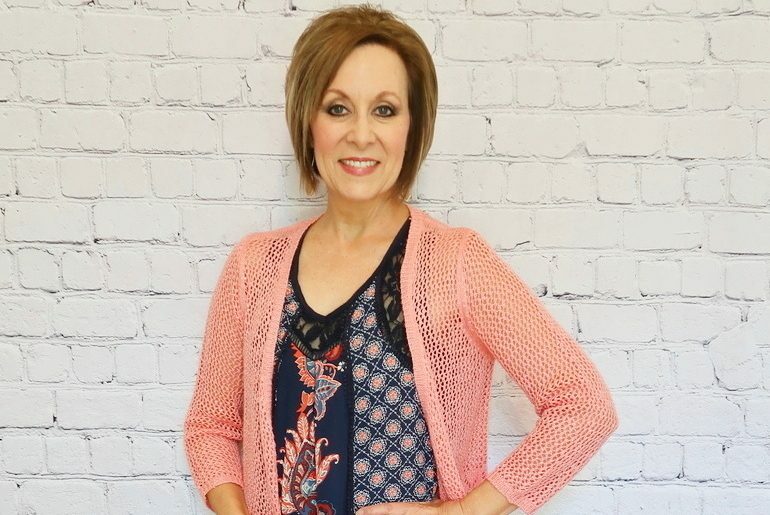 This option on Amazon for the cardigan has many different color choices in a style that is flattering for most body types. Oops!! Need to cut that tag out, LOL. This type of mix and match dressing is how I also pack for a trip. 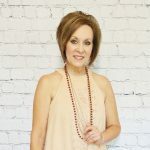 I take very little, but am sure to have third piece options and a couple of tops with basic bottoms and a few pieces of fun jewelry, with two pair of shoes in addition to what I wear upon departure. Did you enjoy this post: How to Style the Third Piece Accent Color? Pin It! 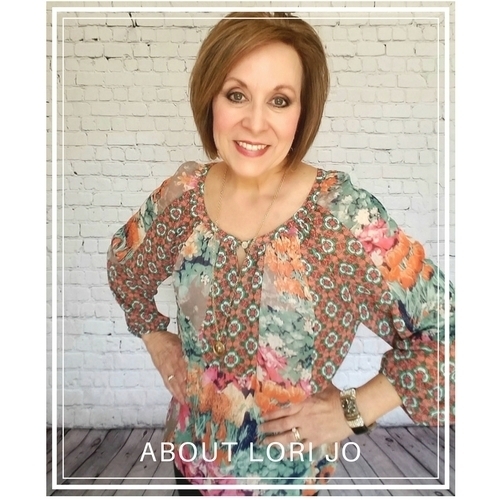 I love the two styles Lori Jo and what a difference just changing from white jeans to the darker denim. I could definitely see me wearing this and I love the addition and the colour of the cardigan. Just lovely and stylish. Hey, Sue! So glad you were inspired by these options. My style advice is for realistic, functional clothing that shows your “flair”, easy and not intimidating, put together without being overly dressed at the same time. Thanks for visiting, talk soon! Hey Lori Jo! I’m alittle late posting, it’s been a hectic week, finally a moment to sit and relax…lol . Great post yesterday, I love how you style your outfits . 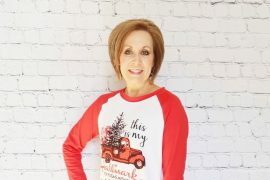 Being retired means I don’t get dressed up everyday, but like you still want to feel like I’m dressed nice enough, if hubby came home and said lets go here, I’m ready! My favorite is with the white jeans, I love wearing white pants, for the simple reason of putting on just about any color top with, white seems to dress up everything. Have a great weekend, we are suppose to be getting another humid hot wave again, it’s been an awesome summer here in New Brunswick!